The fate of US – Saudi arms deal still up for debate as more bad news about the missing reporter, Jamal Khashoggi, is released by Turkish officials. The deal, worth USD 110 billion in arms sales over the next 10 years, may be canceled if Turkish reports linking Saudi Crown Prince, Mohammed bin Salman as the one who ordered the assassination are confirmed. Thus far, many CEOs in technology and media have refused to attend this year Davos in the Desert. Heads of Blackrock, JP Morgan, and Treasury Secretary Steven Mnuchin have also dropped out. Trump is reluctant to cancel the arms deal as he claims the USD 110 billion deal will create 40,000 jobs in the manufacturing sector. However, it is important to note that no source for the figure has been the provided by the administration. According to the Aerospace Industries Association, 335,000 are employed in the private-sector defense industry. While the Bureau of Labor Statistics reports that 153,800 Americans worker is employed to produce both commercial and military aircraft. US weapons expert and analyst for the liberal-learning Center for International Policy, William Hartung, believes this relation between the arms sale and jobs growth is “exaggerated”. Nevertheless, it would be wrong to argue that Donald Trump is the first U.S President to conduct business with questionable parties. The Obama administration has approved more than $278 billion in their eight-year to Saudi Arabia. While President Carter authorized the CIA to spend over USD 500,000 on support for the mujahideen. The reason for such spending is to further American interest in the region. Like the mujahideen, Saudi Arabia is acting as a foil to whoever is acting against American interest at the moment. To conclude, it is wrong or misleading for the Trump administration to continue with the Saudi arms deal, citing jobs creation as the reason. The honest answer is to preserve American interest in the area. Disun Holloway is a graduate from the University of Nottingham in Nottinghamshire in the U.K, with an MSc in Risk Management and a BA in Economics at the University of Oxford Brookes. Disun has always been interested in politics and their economic outcomes. This prompted him to work during his spare time as a macroeconomic analysis writer for the Economic & Finance Society during his postgraduate studies at Nottingham. Besides having an interest in matters of economics and politics, Disun is also deeply interested in the English Premier League as a Manchester United supporter. During his spare time, he can be found going on hikes or kayaking. 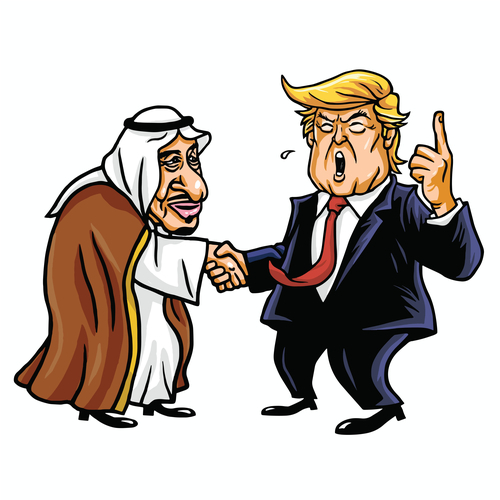 Three weeks before Jamal Khashoggi disappeared, Trump’s foreign business partner signed an agreement with a construction firm in which the Saudi government owns a large stake for a development that includes Trump-branded elements. I believe, #JamalKhashoggi died a tortuous, unimaginably horrible death. For @FoxNews and conservatives to now mount and promote a smear campaign against him is beyond despicable.